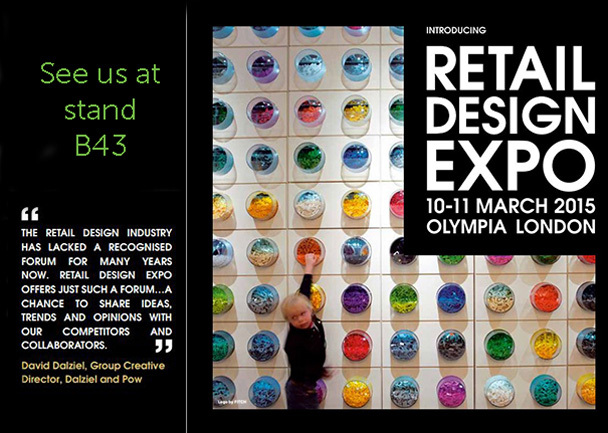 Retail Design Expo 2015 is an exciting new event that will be collocated with the Retail Business Technology Expo (RBTE) at London Olympia. When we were approached at EuroShop earlier this year about the possibility of exhibiting at a UK retail design exhibition we were eager to sign up. EuroShop was a great show for us but having the opportunity to exhibit at a show that promises to gather collaborating partners in retail design, visual merchandising, architecture and shop fitting from across the UK seemed almost too good to be true. We’ve watched with anticipation over the last few months to see who else would sign up to exhibit and have been delighted to see the industry really rally behind the event. There hasn’t been a show like this in the UK before – the retail community were clearly ready for it as Retail Design Expo has taken the entire industry by storm. Keep checking back to find out more about the event and what we will be showing.